What if is an absolute must read! I absolutely LOVED this book. 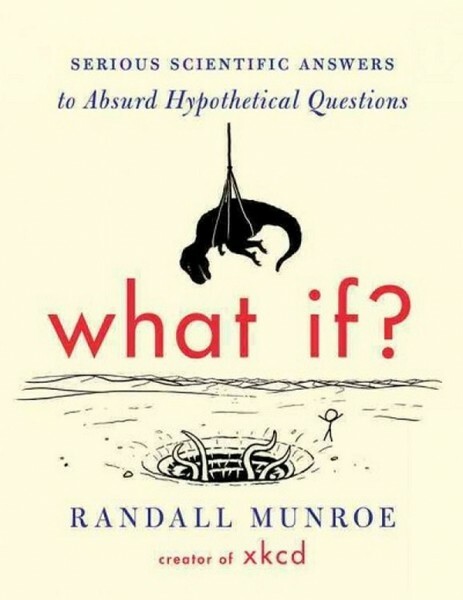 Randall Munroe’s scientifically accurate answers to ludicrous questions are absurdly funny, well written and extraordinarily well researched. I laughed out loud throughout most of the answers. It’s funny how he destroys the world and/or humanity in half of the answers. I kept wondering who are those people who send these insane questions? I particularly loved the answer to the question of what happened if you put a hair dryer in a 1 square meter indestructible box, but frankly I laughed out loud so many times I lost count (and I can’t remember when is the last time that happened!). My only disappointment was that the book ended! I can’t wait for the next installment! If you have not done so yet, read the book. Your inner nerd will love you forever!